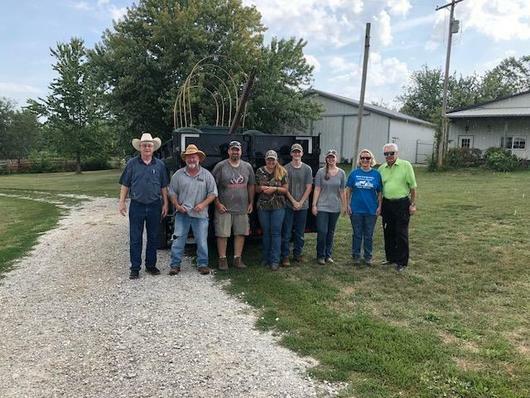 We were First Place at the Cattlemen Days Rodeo Parade is Ashland, MO! 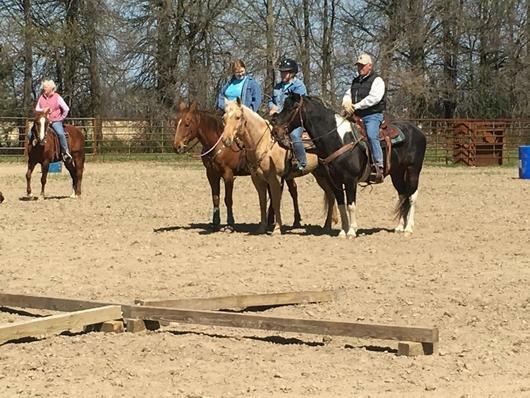 We have some great horse clinics at the Cowboy Church! 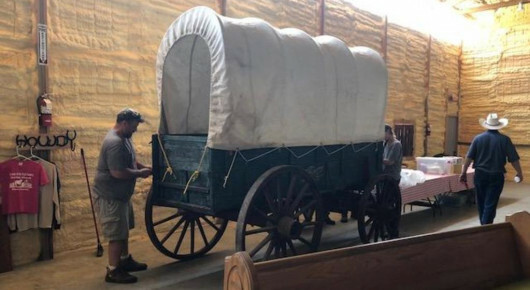 Come see our authentic Old West Wagons at the Cowboy Church! 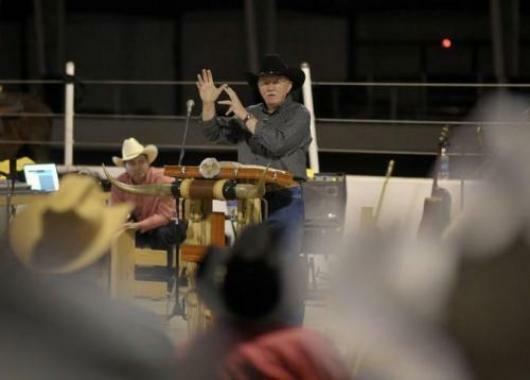 Water comes to the Cowboy Church! Thanks Robert Phillips! Work on our new building addition is progressing with the hard work of our members! 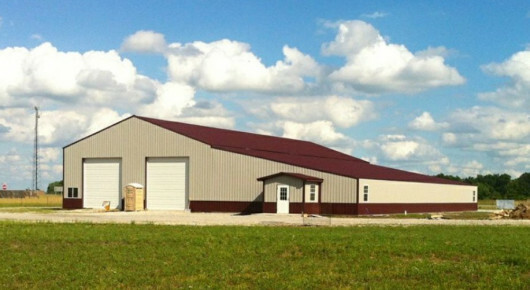 God has blessed us with this great building! 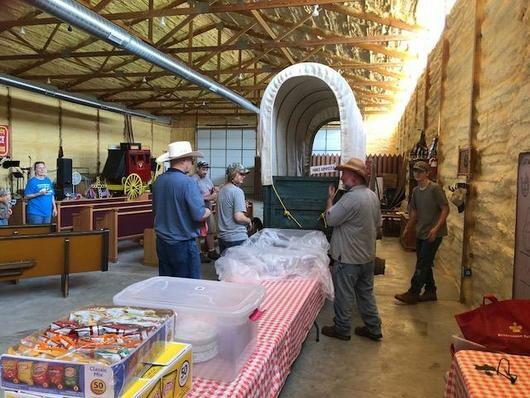 The Chuck Wagon arrives at the new Cowboy Church building. 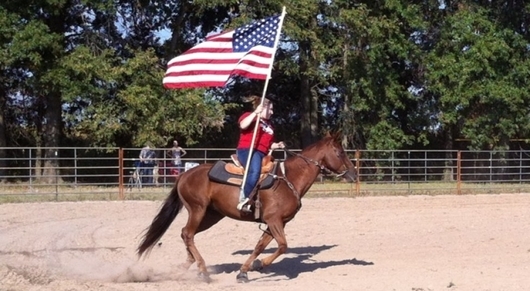 We salute and thank our Veterans for their service! Pastor Dale loves to lift up the name of Jesus! 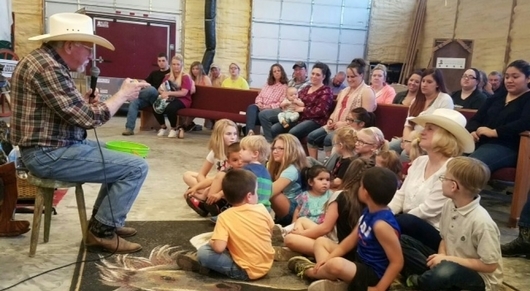 Pastor Dale shares a story with the Buckaroos! The Second Time Around plays some great Christian Cowboy Music. 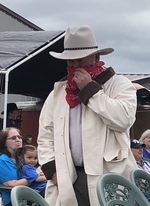 Breakfast Cowboy-style at a Sunday Service. That's a bunch of eggs, Ray! 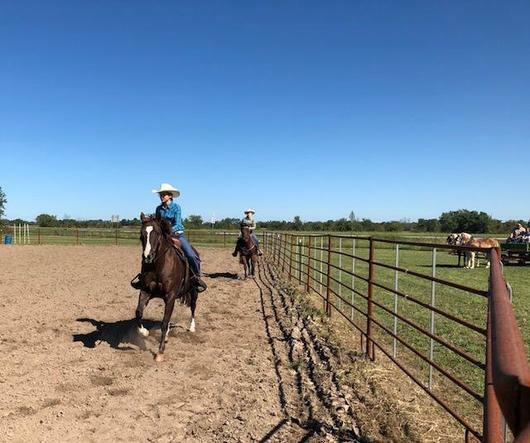 Iron horses and real horses are welcome at Cowboy Church! 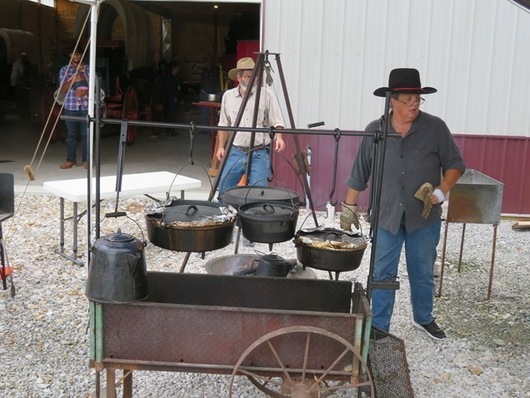 Fellowship meals start at the Chuck Wagon! 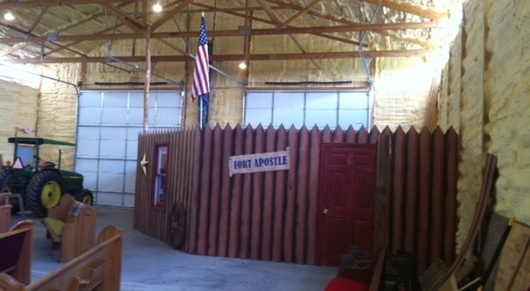 Our Children's Bible Leaning Area, "Fort Apostle'"
The Annual Peep Shoot is a "Moving Experience!" Thanks to everyone that sponsored one of our nice new (to us) pews. 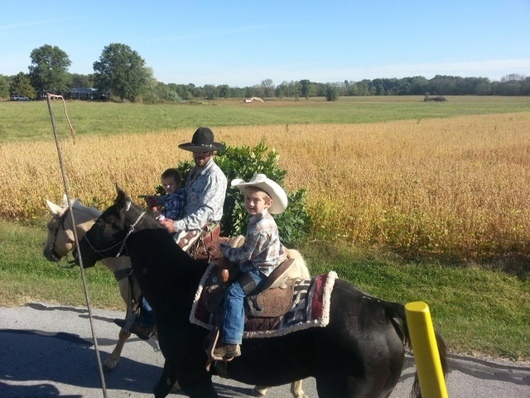 Kids get to ride at Cowboy Church! 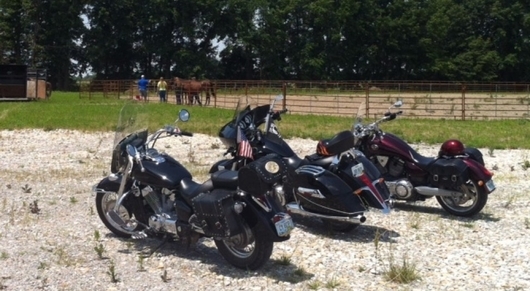 We rode our iron horses from Harrisburg BC over to Cowboy Church. Bad Bud and Wild Phil hold up the stage. 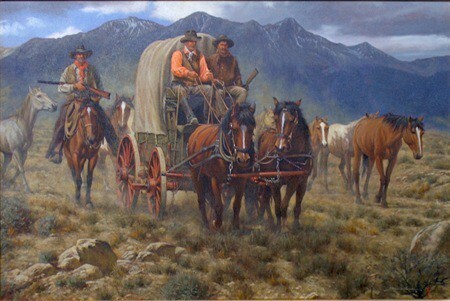 "Who took your horses?" 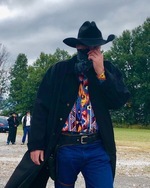 Clark Dalton, a true cowboy that loves the Lord and Cowboy Church! 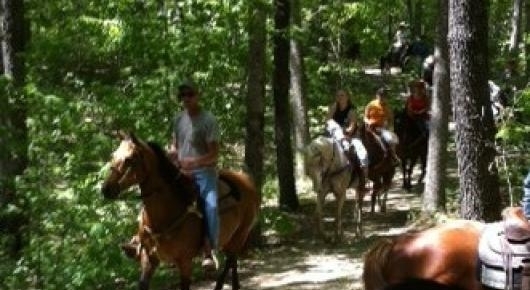 Getting ready for a trail ride. 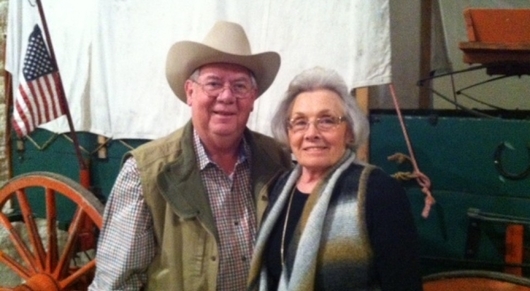 Donal and Betty love Cowboy Church. 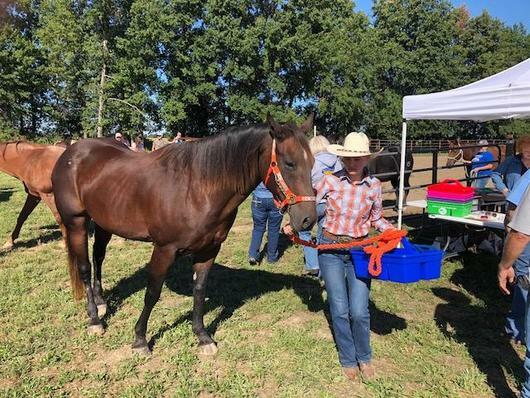 We baptize cowboys and cowgirls in a horse trough. 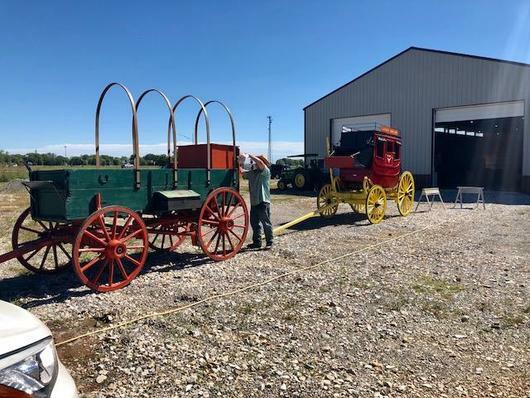 A cool display of Cowboy Gear from the Old Days! 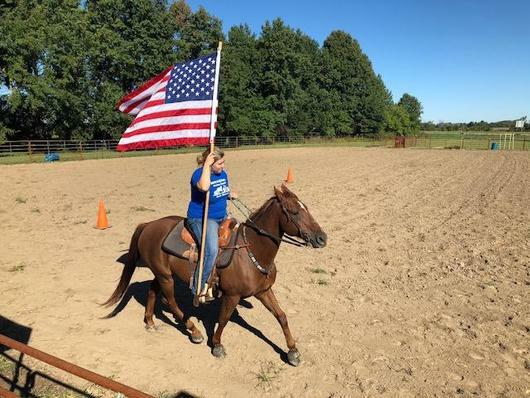 These gals know how to shoot from a galluping horse. Ready for a great day on the trail at the Rudolf Bennitt Conservation Area. 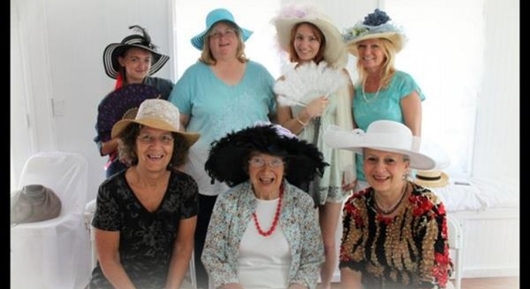 The Kentucky Derby Tea was great fun! 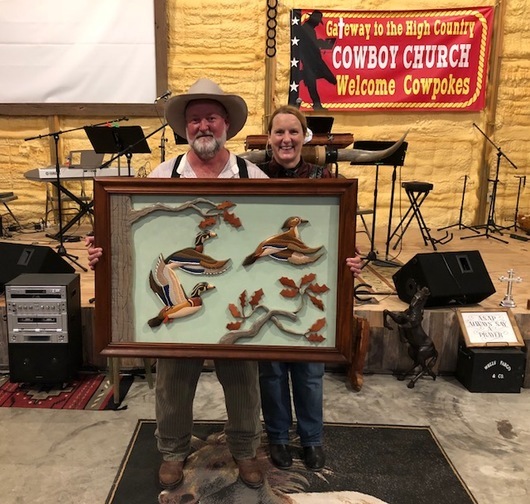 $200 was raised for the Cowboy Church Building Fund. 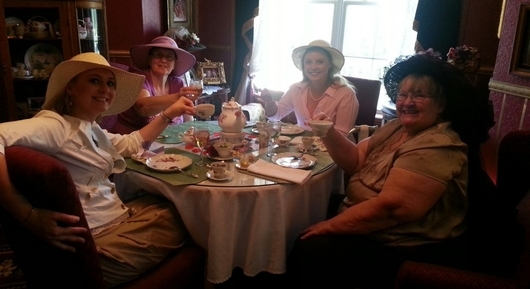 Ladies enjoying the Kentucky Derby Tea at the Victorian Country Inn, Love the Hats! 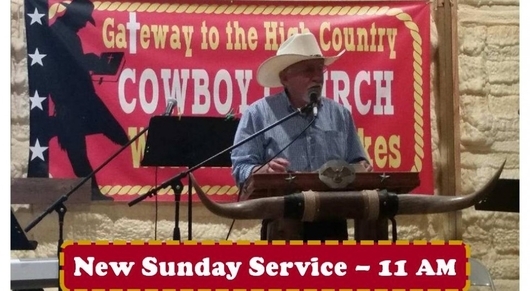 Everyone Welcome Sundays at 11 am and Mondays at 7 pm. 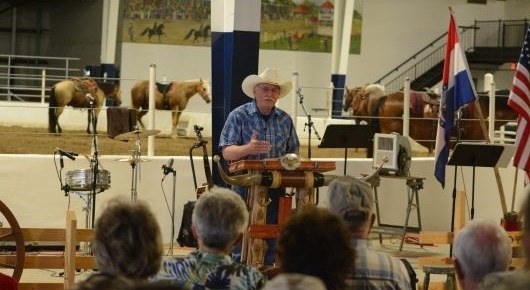 Pastor Dale explains the Christian Cowboy Way. The messages are biblical, about the Christian walk, and from the heart. 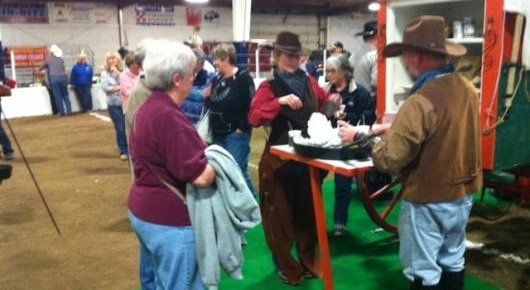 People of all ages enjoy Cowboy Church. 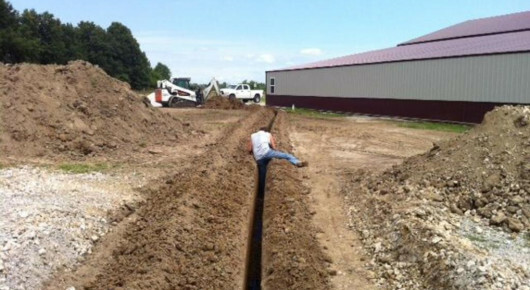 There is plenty of room for you. Come as you are! 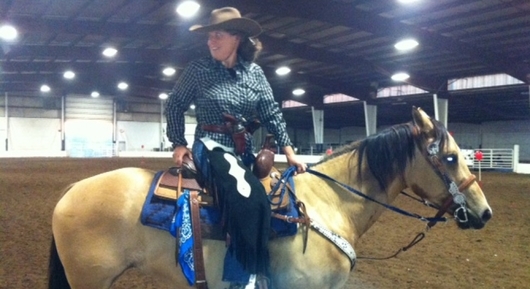 Christian Cowboy music is what we love! 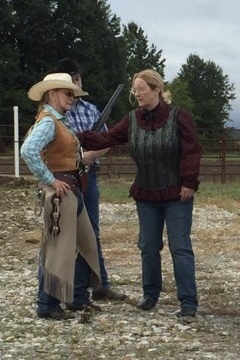 Our offerings are put in a pair of Cowboy boots. 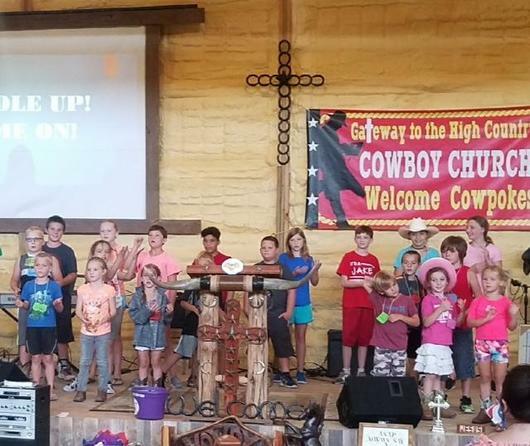 Cowboys and Cowgirls of all ages love Cowboy Church. 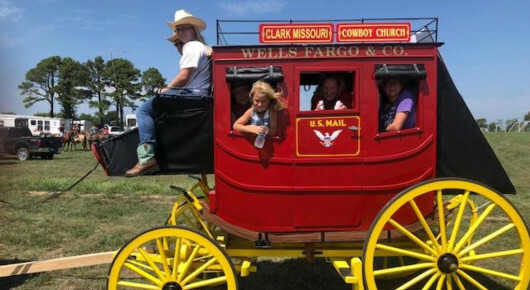 Cowboy Church is a family experience. 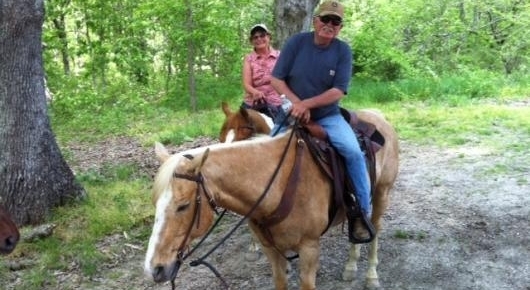 Sandy and her horse, Dixie. 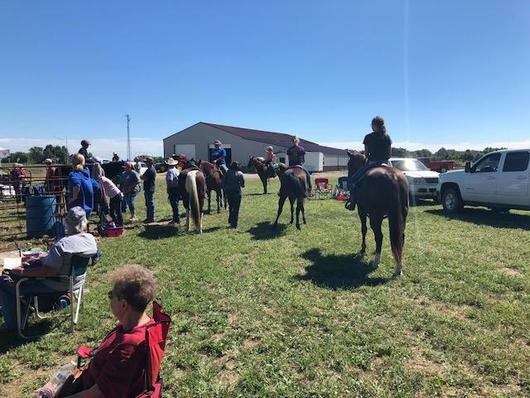 The Stick Pony Race at our Summer Cowboy Church Fun Show in Ashland. 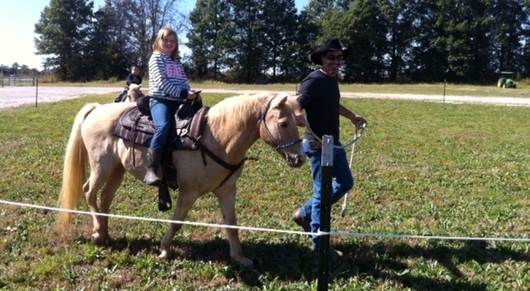 Mike McDow on his pretty pony. 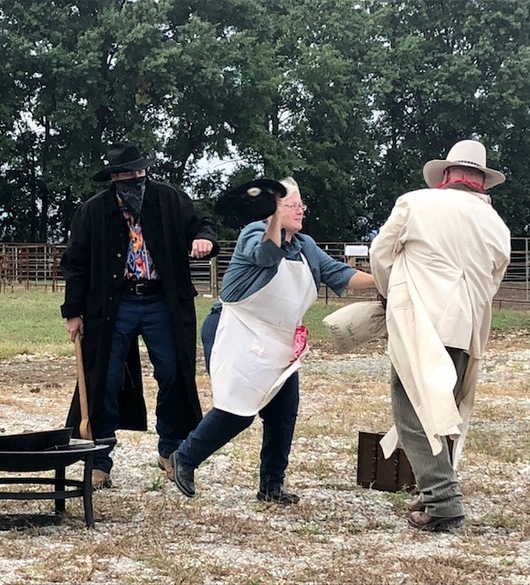 Barb Spencer prepares the Cowboy Grub at the Fun Show. Kids had a blast at the Fun Show. 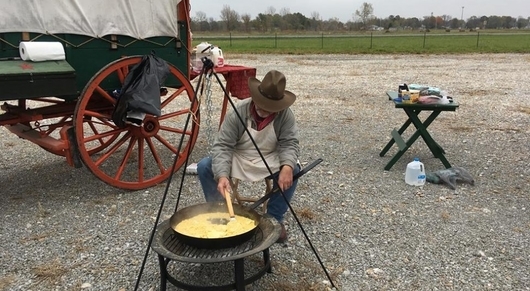 Cowpokes are hungry after a 3 hour Trail Ride. 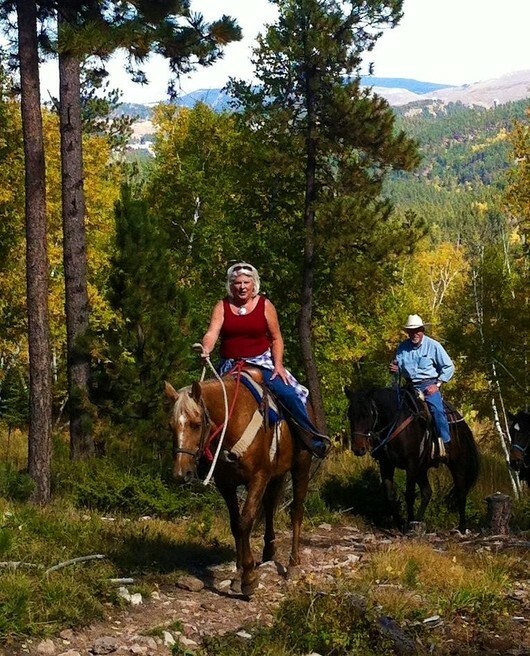 Fred and Jane Craig ride the Bennett Trail. A beautiful day on the trail. 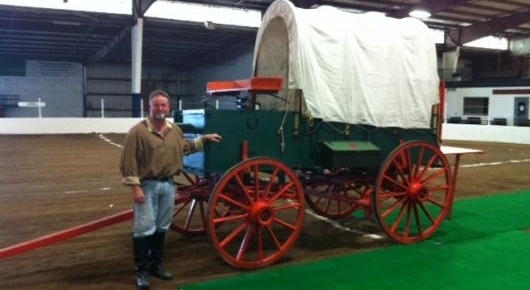 Ray Spencer brings his Chuck Wagon to Cowboy Church. 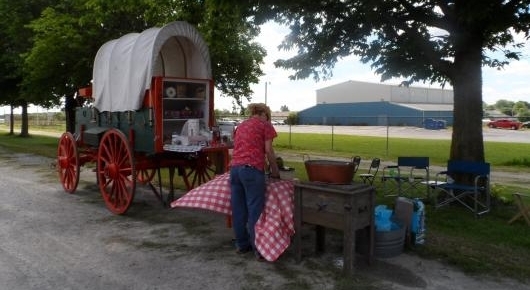 Barb and Ray Spencer serve up the warm grub at the Chuck Wagon. 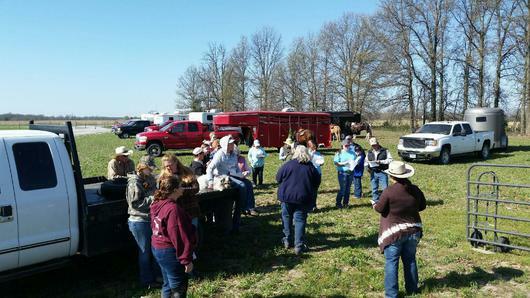 Cowboys and Cowgirls are hungry to learn about the Lord and His Word. 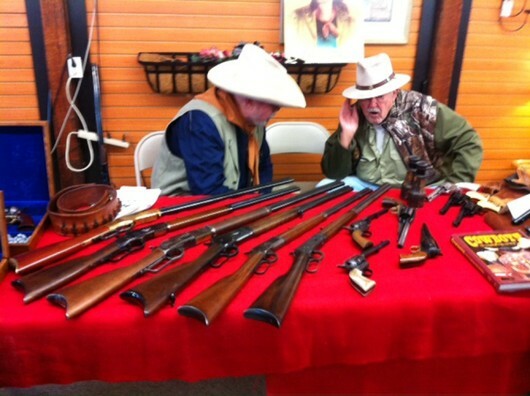 Charlie Martin (Left) joined our late, great friend, Kyle Garrett (Right), in heavenly glory Friday, April 12th. 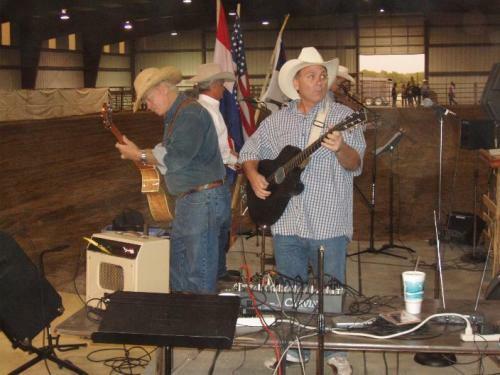 Our hearts are both heavy (for our loss of another great Christian friend), yet rejoicing (because we know he is with his Lord and because we had the privilege of knowing him and calling him friend).This photo is of Charlie, Kyle and some of the the rest of the, "Ten Gallon Hat Cowboy Band" that helped the Gateway to the High Country Cowboy Church launch 8 years ago. Our hearts go out to Denise, Leslie and all the family and friends. "It is with a broken heart I share that I lost my true love Charlie. 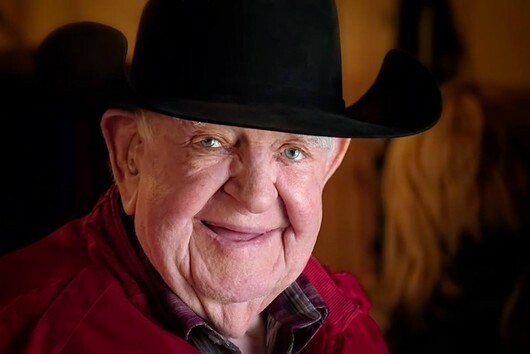 Visitation will be at Robinson’s Funeral Home Ashland Sunday April 14th 4-6 pm. 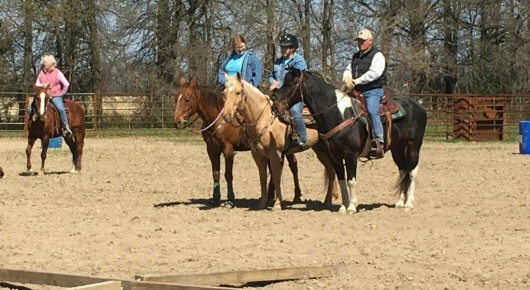 The funeral will be Monday April 15th at 11 am at Mt Pleasant Baptist Church Hartsburg MO (Next to the Eagle Knoll Golf Course.) I am secure knowing that he is with the Angels playing bass guitar in the presence of our Lord"
(The Sunrise Service will last about a half hour) Donuts, coffee and juice will be provided during a fellowship time after the service. You are also welcome to bring any goodies to share for that fellowship time! 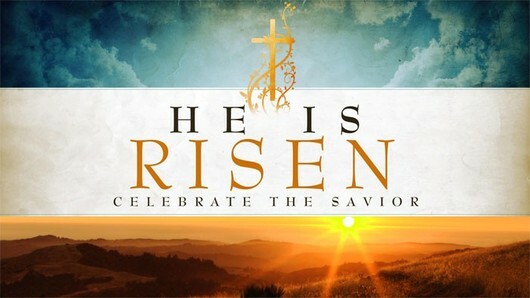 Easter Sunday, with the Lord’s Supper, at the 11 am service. 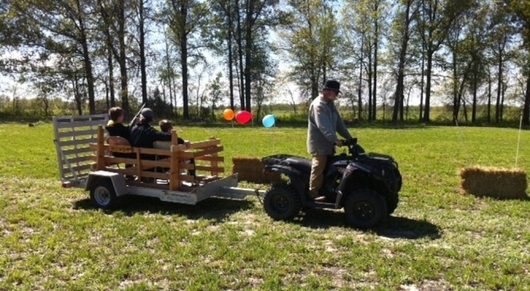 The Kids’ Easter Egg Hunt will be right after the 11 am Sunday Service. Donuts, coffee and juice provided for adults and kids at a fellowship time right after the Easter Egg Hunt! Thanks to all our church family that worked to make it a great day! Praise God for a beautiful day! 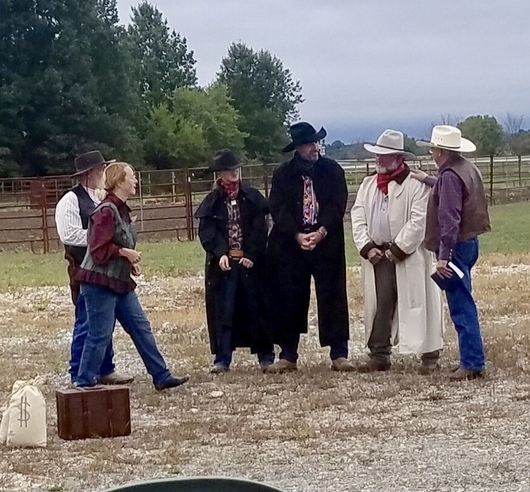 The Chuck Wagon Dinner and Wild West Show was a great success with 75 people enjoying a taste of the Wild West and some Cowboy Fun! 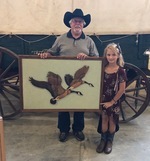 We also raised over $5,000 for the cowboy church building fund! We Praise the Good Lord for a Great Day! 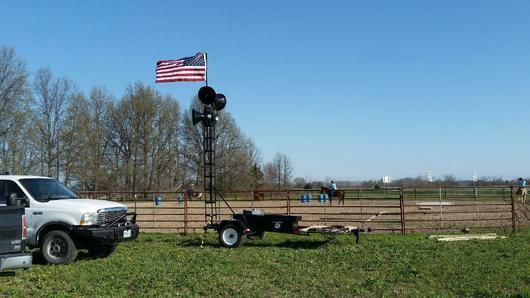 Thanks to Ray (Bad Bud) and Barb (Mrs B) Spencer for putting this whole shin-dig together! 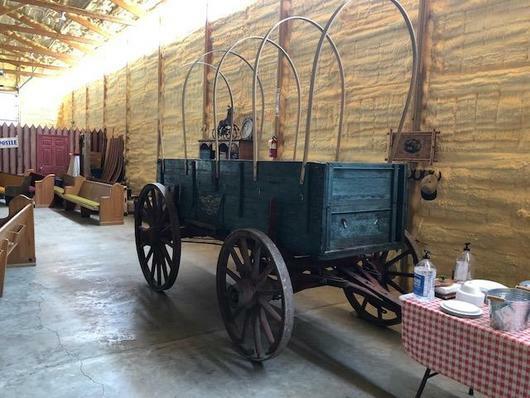 We are excited to have this great old covered wagon donated to the Cowboy Church by Gary Evans of Columbia, Missouri. 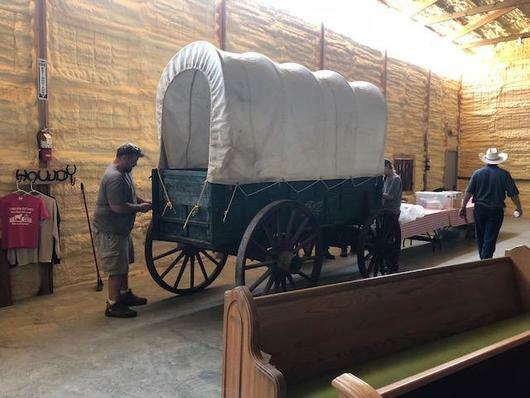 Thanks to the great moving crew that brought the covered wagon over to the cowboy church! 30 Children Enjoyed a Great Week of Fun and Jesus! 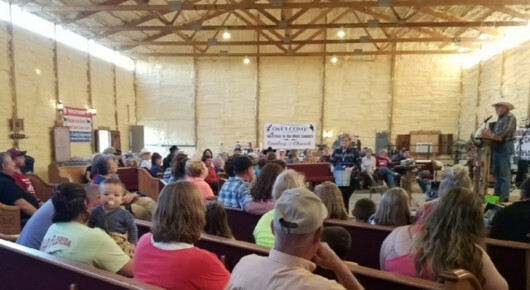 Over 90 People enjoyed our Friday Night VBS Parents' Night! 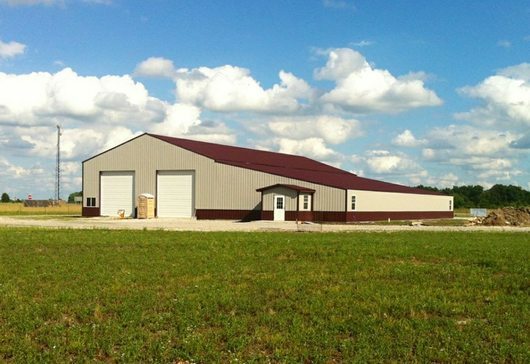 To say that our new building expansion project is zooming along! 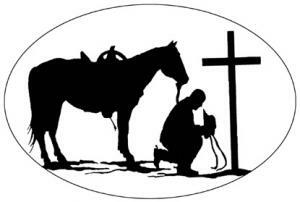 Come join us for Worship of the Good Lord at the Cowboy Church Sundays at 11 am and Mondays at 7 pm! 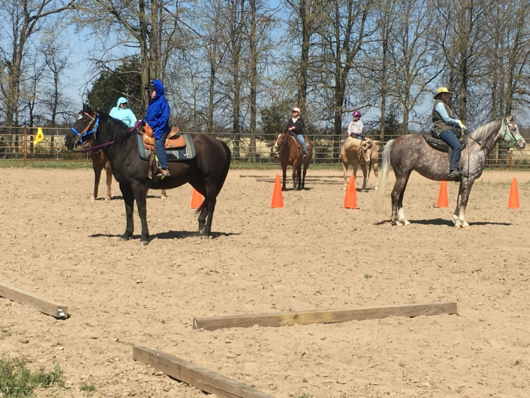 OurTrail Class Obstacle Clinic was a great success with 14 horses and riders and 10 people observing. 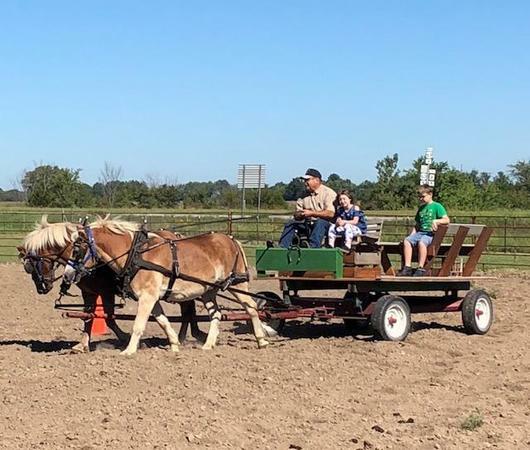 Thanks to Jaque and Steve Barker, MaryAnn Larsion and all who helped and participated! 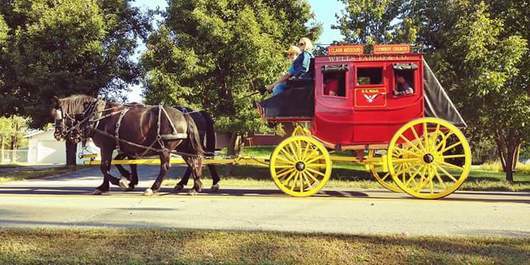 We participated in several parades in 2018 with the stagecoach and horseback riders! 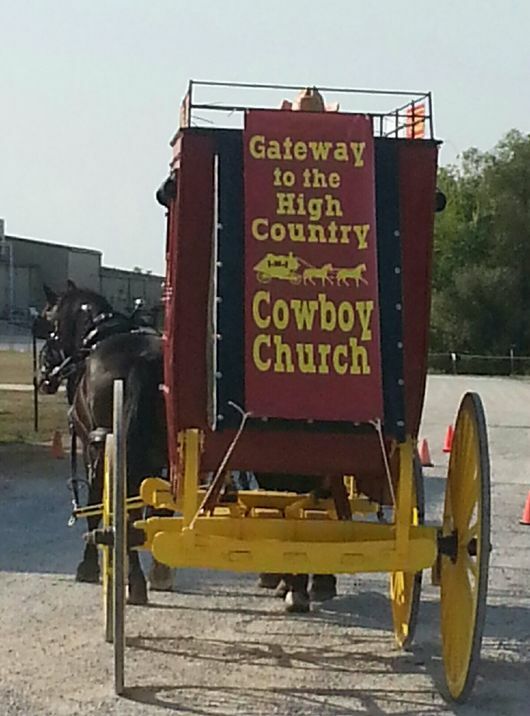 Our Great Cowboy Church Building and Grounds! 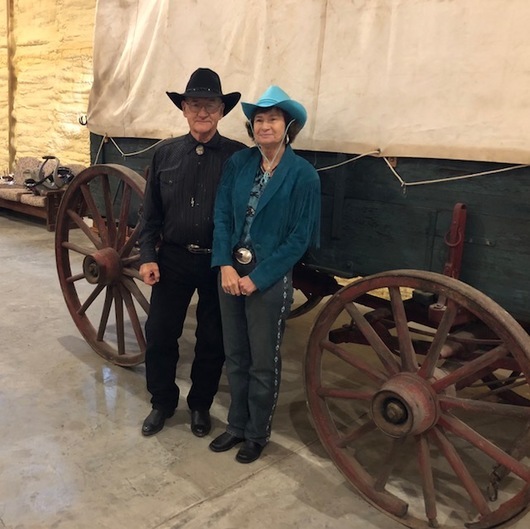 Pastor Dale and MaryAnn Larison welcome you to the Gateway to the High Country Cowboy Church. 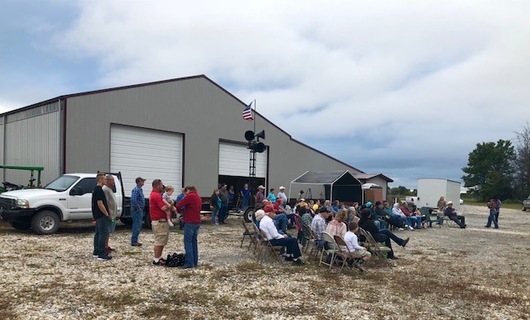 Put on your blue jeans, saddle up (your car or truck) and head out some Monday evening at 7 pm to our new building at Hwy 63 and Hwy B in Randoph County just across Hwy 63 from Clark, Missouri, for great Christian Cowboy Worship and Cowboy Fellowship. Now also meeting on Sunday Mornings for Worship at 11 AM! 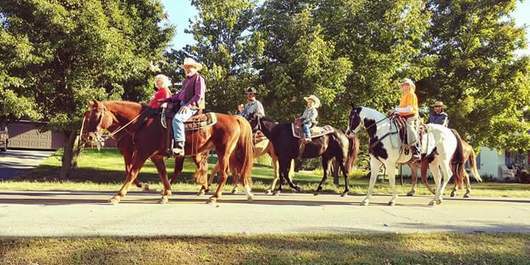 From Columbia, take Hwy 63 north for about a 20 minute drive, turn left (west) at the Higbee, Missouri exit onto Hwy B and you are there. From Moberly. 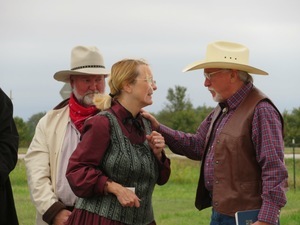 go south about 12 minutes on Hwy 63 and then turn right (west) at the Higbee, Missouri Hwy B exit and you are there. 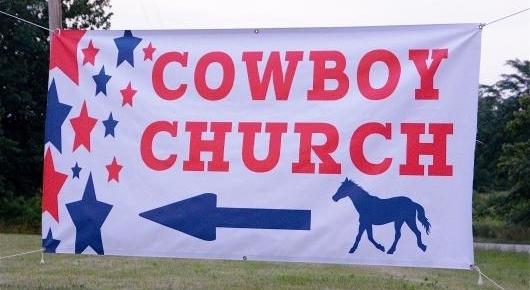 You don't have to have a horse to attend the Cowboy Church. 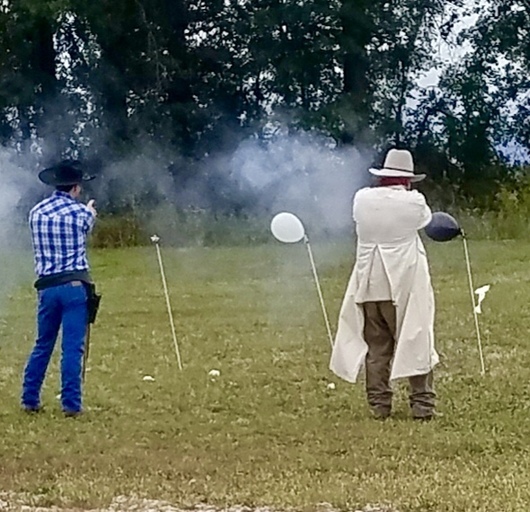 This Cowboy Church is for anyone that has that independent American Cowboy Spirit and likes the idea of a laid-back, come as you are church, in a unique setting.